I had a change of plans yesterday. I found eggplants and mushrooms on sale for half price at a local grocery. We tried growing eggplant in our garden this year to miserable failure. If the weather holds through October we might – might – have a couple measly, scrawny examples before frost. But I wouldn’t bet the farm on it. 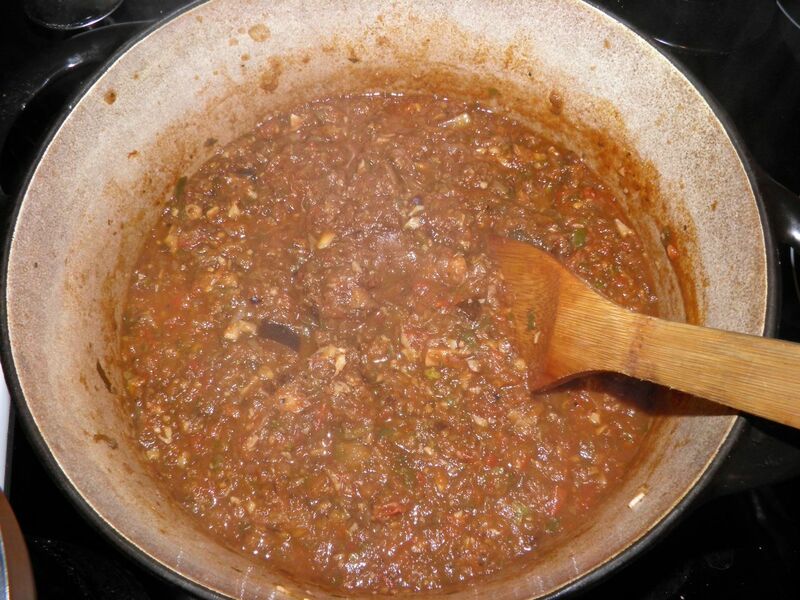 The sauce after simmering 1/2 hour. I went to the grocery store looking for deals. This Sunday shopping has put a bit of a wrinkle on on-sale meats and such. Before 7-day shopping, groceries used to put meat on sale Saturday night that the “best by” date wouldn’t last through until Monday. I thought since today is a holiday the same would hold true. Nope. Perhaps we were early. But I did find eggplant and some excellent mushrooms bagged and at 50% off. That’s where the change came in. 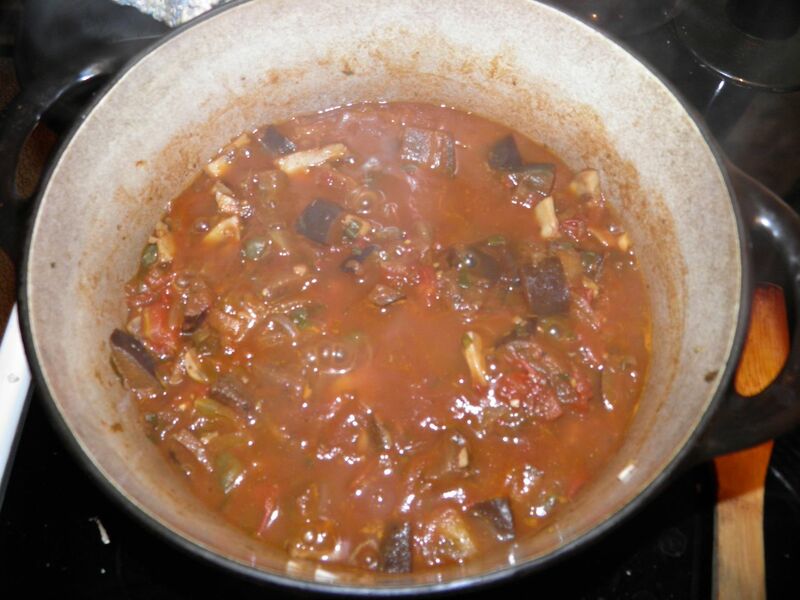 I was going to make tomato sauce anyway, so it changed to eggplant/mushroom. It may have been fortuitous because this sauce is almost hearty enough to just be served on pasta as it is, no additions. Of course feel free to add what you would like. Chicken or sausage would be good. So when life gives you lemons (or eggplants) it’s best to carpe diem. Hope you like. I’m starting to get a bit of a shelf full of canned goods from the garden. It’s quite a rewarding feeling. interesting and satisfying end result. In a large Dutch oven pot heat the olive oil over medium heat. Add the onion and garlic and mushrooms and cook until the mushrooms begin to brown. Add the remaining ingredients and stir well. Bring to boil, reduce heat to medium low, cover and simmer for a half hour, stirring occasionally. While the sauce is simmering sterilize four 500 ml canning jars. Once the sauce is cooked, either mash – or purée with a stick blender – about half of the sauce, leaving chunks. Pour into the sterile jars, wipe the rims and seal. 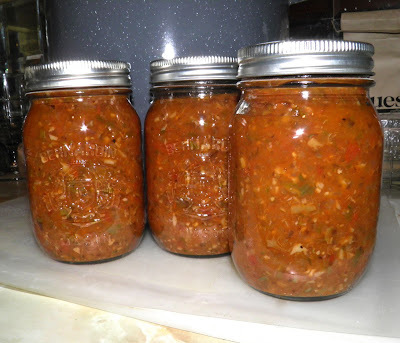 Place the jars in a large pot with enough water to cover the tops about 1". Process in boiling hot water bath for 35 minutes, then remove and let cool on the counter. As they cool the lids will "pop" down. Once cool, retighten the lids. Store in a cool, dry place until ready to use. Refrigerate any jars that the lids don’t snap down on. They aren’t vacuum sealed. Do not process the small amount leftover. Refrigerate it. That little bit of sauce can be used within 1 week. I've read on a few sites that you should add 1 Tbsp lemon juice to the jar for every 500ml of sauce. It makes it more acidic. Many recipes don't call for this. The jars are vacuum sealed so *shouldn't* go bad. If you're at all worried add it.